We start “30 Days Without An Accident” after a time skip. It’s unknown how long it has been since the end of last season. Based on the title and development at the prison, my guess is that it has been around three months. During the cold open, Rick listens to a country song as he tends to a small garden patch located in the farm area of the outer prison yard. While digging, he discovers a handgun buried in the ground. Rick is distracted when he hears the sounds of a half-dozen walkers at the prison gates. He shrugs it off and throws the gun into his wheelbarrow. After the title sequence, Carl approaches Rick. They observe one of the pigs that the group has been raising, named “Violet” by Carl, is sick. Rick is more concerned that his son is naming their livestock. Daryl walks into the breakfast area while Carol and Patrick, a young teen from Woodbury, prepare food. Carol tells Daryl to join her by the fence and then asks the teen to take over cooking duties. Patrick congratulates Daryl on another successful hunting trip. 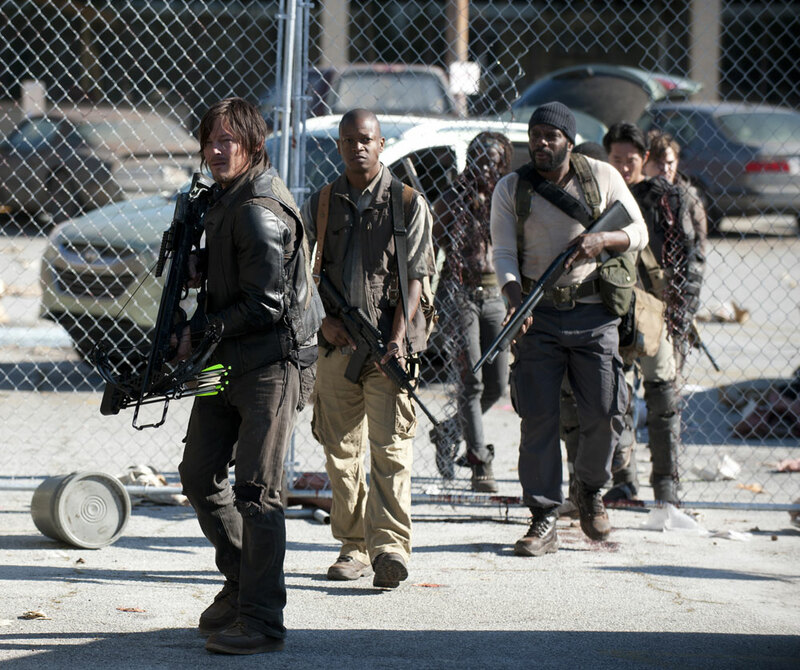 Carol and Daryl approach the fence as residents stab walkers through the fence. She notes that the walkers are no longer spread out, and are instead massing at Tower 3. While the walkers are still manageable, they won’t be for long. Inside the prison, Glenn and Maggie wake up in their cell. Glenn doesn’t want her to join the supply run the group is making later in the day. When he remains adamant that she stay at the prison, she acquiesces. We return to the group on fence duty. Tyreese tells his girlfriend, Karen, that he’s thinking about going on the latest supply run. He prefers supply runs, as his behavior is all instinctive reaction. Tyreese finds staring the walkers in the face and very consciously stabbing them more difficult. Karen understands and kisses him. Daryl prepares to leave for the supply run. Zack, one of the new characters, has a romantic moment with Beth. When she refuses to wish Zack goodbye Daryl snarks that this has become a “damn romance novel”. 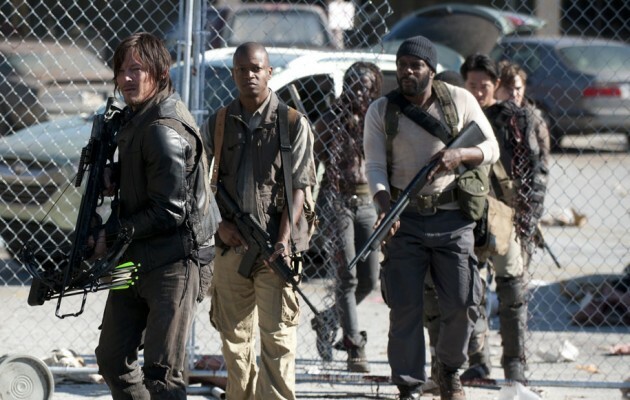 Bob Stookey walks up to the supply group and asks to join. Sasha is hesitant to let Bob, who was found between seasons, join them. She’s suspicious as he was discovered on his own. When Glenn points out Bob was a medic in the army she reluctantly allows it. Nearby, Rick and Hershel study the crops as Michonne returns from a scouting trip. Rick and Carl race to open the gates. While Michonne didn’t find much, she did bring Carl some souvenirs. She decides to accompany the supply group when Rick refuses to join. Upon Rick’s return to the farm area, Hershel tells him that the council (Daryl, Sasha, Glenn, Carol and Hershel) wants him to carry a gun when he’s outside. Rick reluctantly agrees to do so as he goes to inspect the animal traps. While outside, Rick encounters Clara. She begs Rick to take her and her husband back with him. Rick is reluctant to do so and will only agree to it after they arrive at her camp and answer his three questions. Back at the prison, Carl and Patrick walk up to a group of kids at the fence. Carl chastises the girl who names walkers and tells him they’re still people, just “different”. The kids run off for “story time”. Patrick, despite being older, admits to liking “story time” too and joins the kids. The supply group arrives at the Big Lots knockoff and cases the place before entering. The story hints at alcoholism as Bob wonders whether to take a bottle of wine. As he places it back, the shelving unit collapses on him. This alerts walkers in the area, many of whom are on the roof, to their presence. Walkers fall through the decaying roof and attack. Zack is bitten as he and Daryl rescue Bob. Zack and the walker are crushed as a downed helicopter falls through the ceiling. The rest of the group manages to escape. Patrick excuses himself from “story time” due to illness. Carol instructs the children on the proper use of knives. Carl discovers what Carol is teaching the kids and runs off when she asks him to not tell his father. After the supply group returns, Tyreese admits to Karen his equal dislike of supply runs. Glenn also visits Maggie. Daryl tells Beth about Zach’s death. She doesn’t cry or mourn him, or even show any visible reaction. She tells Daryl she was happy she didn’t say goodbye, before resetting a chalkboard that proclaims “This Workplace has gone 30 days without an accident!” to zero. Meanwhile Patrick staggers to the showers stalls, coughing heavily. He turns the water on and begins convulsing and coughing into a nearby barrel of water. He collapses on the floor, and soon wakes as a walker with bleeding eyes. Reaction: I admit being concerned when the showrunners were replaced yet again on The Walking Dead with the promise of more “characterization”. The last time this happened we got the low-budget, meandering season 2 which I am still not fond of. The scene with Rick and Clara was precisely what I was afraid of. It dragged on too long and served no real purpose other than to add more surrealism to what was going on. However, the scene with the walkers falling through the ceiling was one of the most inventive scenes I have seen on this show, it was an instant classic. Michonne slicing through zombies, lots of awesome zombie killing shots (particularly Daryl putting his boot down on a crippled walker), and finally a helicopter comes crashing down killing everything else. There were a lot of new characters introduced, with two of them are already dead by the end of the episode. Zack’s death was predictable from the moment he was introduced, especially considering Beth did not say goodbye to him. Less unpredictable was Beth’s rather apathetic reaction to Zack’s death. It just did not register with her, and her chalkboard tally may be her way of coping with what is going on. It’s an interesting character moment for Beth and hopefully it’ll get expanded on. It’s also pretty interesting that there seems to be the beginning of a disease beginning to ravage the camp. And of course, all who die are going to become walkers and start attacking the camp from within. There’s a lot of survivors from Woodbury here, which means there’s a lot of random extras waiting to die. That’s something that hasn’t happened before on The Walking Dead and it’ll be interesting to see how that’s handled as well. Going into this I’m much optimistic than I was in season 3, which is a good thing. There definitely are some slower moments here but other than Rick and Clara, which served no purpose other than being really creepy, everything else seemed to matter, even Zack from the POV of Beth’s characterization. It says a lot about how both Beth and Daryl have changed since their introductions, as Beth seems to have become emotionally numb and Daryl is more affected by Zack’s death than Beth is. We’re starting season 4 in interesting territory here… hopefully it’ll all pay off. I can’t help but wonder who’s the first person Patrick’s going to eat after turning. I’m expecting another Woodbury resident, but you never know… we’ve been caught off guard before.